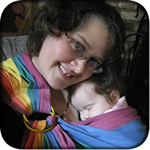 WCRS info page: This covers everything you'll need to know about having a wrap conversion ring sling (WCRS) made, including a calculator for wrap splits and explanations of all the questions and options I have on the ordering page. WCRS order page: After you've read through and understood the above, you can place your order here. This is for any ring sling made with a finished wrap (that is, it's either hemmed or has good selvege edges). Custom wrap hemming: For wrap chops (shortening a longer wrap), wrap splits between two customers where a sling and shorty or two shorties are being sent to separate addresses, hemming existing slings, and having scarves made from leftover pieces of an appropriate size. Regulatory changes: Regulations concerning the testing of ring slings and wraps are now in effect. All slings I sell must either be sewn before the deadline of January 30, 2018, or have been tested with my shoulder designs. This is the case for everything remaining on my site.